When you child enters elementary school they will experience more sitting still, left brain, language oriented learning and much less hands on learning. 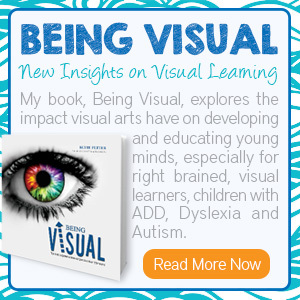 For visual learners, seeing is learning. They need to have a picture to commit to memory when learning new concepts and they often need help organizing their thoughts. 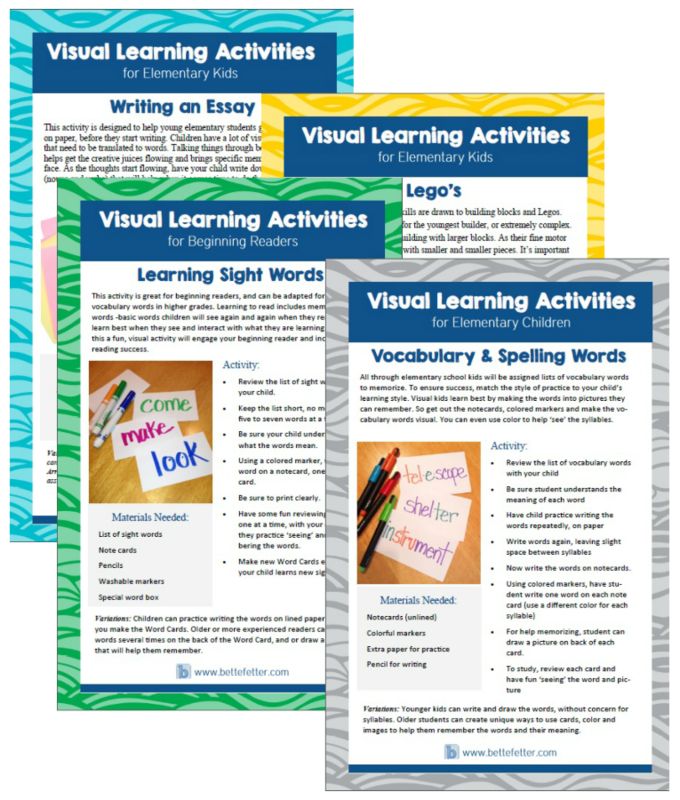 We want to help you help your child operate successfully in the classroom and have designed these activities (free downloads) with your visual learner in mind. I have created some great visual ways for your child to learn sight words and spelling words, organize their larger writing projects and work on visual organization. We’ve created a great way to study sight words that emphasizes colors and visual stimulation.This activity is great for beginning readers, and can be adapted for learning vocabulary words in higher grades. 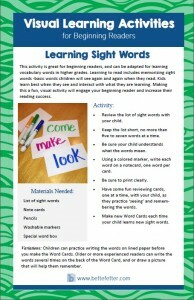 Learning to read includes memorizing sight words -basic words children will see again and again when they read. Kids learn best when they see and interact with what they are learning. 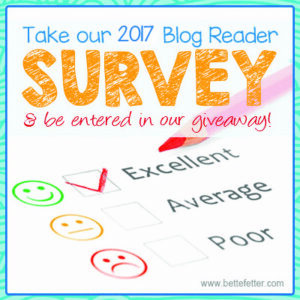 Making this a fun, visual activity will engage your beginning reader and increase their reading success. 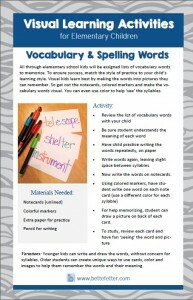 All through elementary school kids will be assigned lists of vocabulary words to memorize. To ensure success, match the style of practice to your child’s learning style. Visual kids learn best by making the words into pictures they can remember. So get out the notecards, colored markers and make the vocabulary words visual. You can even use color to help ‘see’ the syllables. Or draw pictures to coordinate with the words. Being able to organize things is essential for future success in learning. 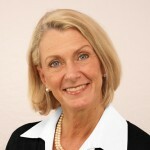 Why not use something they love already to teach organization? Children with strong spatial skills are drawn to building blocks and Legos. Lego sets can be very simple for the youngest builder, or extremely complex. Young children should start building with larger blocks. As their fine motor skills increase, they can work with smaller and smaller pieces. 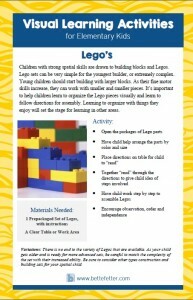 It’s important to help children learn to organize the Lego pieces visually and learn to follow directions for assembly. Learning to organize with things they enjoy will set the stage for learning in other areas. 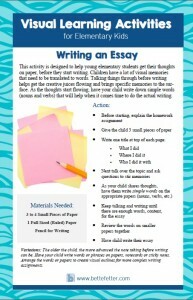 Our writing an essay activity is designed to help young elementary students get their thoughts on paper, before they start writing. Children have a lot of visual memories that need to be translated to words. Talking things through before writing helps get the creative juices flowing and brings specific memories to the surface. As the thoughts start flowing, have your child write down simple words (nouns and verbs) that will help when it comes time to do the actual writing. Using sticky notes makes it easier to rearrange their thoughts to form the most complete organized piece of writing. 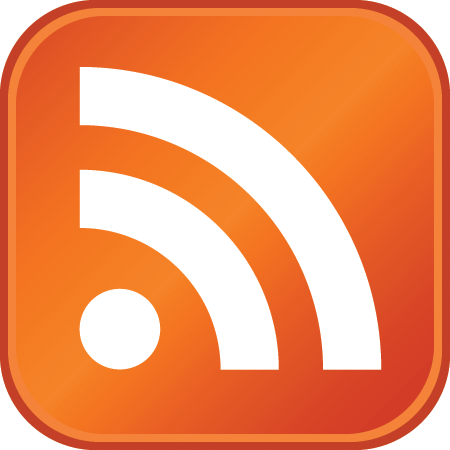 This doesn’t need to be dry research based writing it is great for story writing as well.